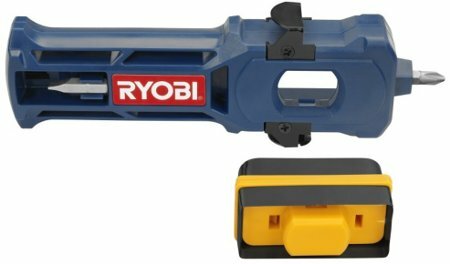 Ryobi claims the kit includes both a 1″ Phillips bit and a 1″ 8-10 slotted bit. I have no idea what a 1″ Phillips bit is; maybe they mean #1 Phillips, or that the bit is 1″ long. Does 8-10 slotted mean #8 to #10 size screw? Again, usually you specify slotted screwdriver sizes in fractions. Somebody fell down on the job in the marketing department. Anyway, you can find the door latch installation kit for $10 at your local Home Depot. 1″ bits are also commonly called insert bits (and are 1 inch long), versus the longer (2″+) bits that have a hex quick connect shank on them (power bits). You know what the problem with tools like this are? I always find out about them AFTER I’m done the job I need them for. What’s up with that hammer? Why the protrusions on either side of the head? (that’s what she said) Is the slotted side for pulling nails? Can that screwdriver reach the knob escution screws? Odd hammer. I’m guessing magnetic nail starter on one side. Come on bill, you know that driver isn’t going to get those screws in there. Besides, this is a “latch” installation kit not a “lockset” installation kit. 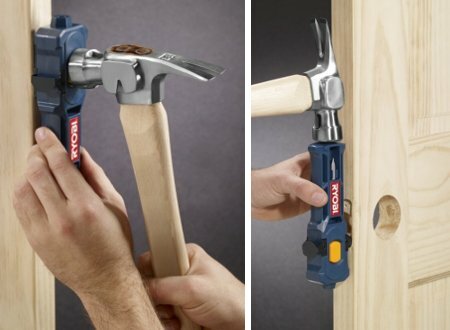 They should have packaged this with the hole saws for the lock install – then it would be a complete kit minus the Ryobi drill/driver you will buy. Oh, I get it now! You hammer the scoring tool in, then use the blue thingy as a chisel to remove (mortise) the wood. Looks nifty but I’d have to see it in action and also see how it does with the grain running the wrong way. At least Bosch calls them insert bits. I still don’t understand why they didn’t say what size Phillips bit, isn’t that more important then the fact it’s an insert bit? Plus they say what size slotted insert bit they include. I’ve thought about it for a while and I think that calling it an 8-10 slotted bit makes much more sense then calling it by it’s fractional size. It’s easier to remember what screws you are using than the length of the slot.